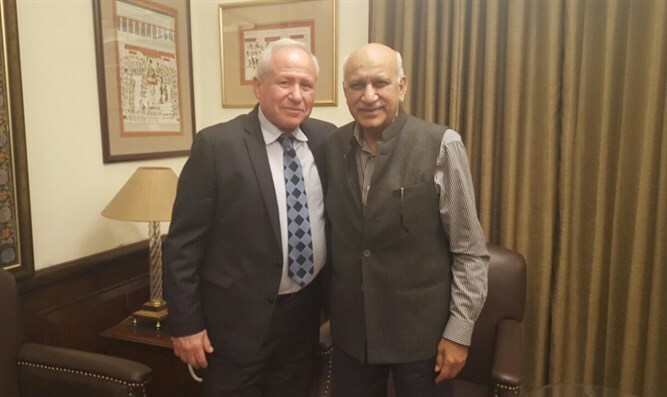 Former Shin Bet chief MK Avi Dichter meets with Indian Dep. Foreign Minister in New Delhi, discuss potential for closer relations. Former Shin Bet internal security agency chief MK Avi Dichter (Likud) met earlier this week with Indian leaders, who the MK says are seeking closer ties with the Jewish state. MK Dichter, who currently chairs the Knesset’s Foreign Affairs and Security Committee, described a meeting with India’s Minister of State for External Affairs, Mobashar Jawed Akbar in a Facebook post Tuesday night. “We spoke about bilateral ties between Indian and Israel. He expressed a desire and hope that ties between us will develop not just along financial lines but in a deeper way as well, with an emphasis on deep mutual understanding between Israelis and Indians,” Dichter wrote.